In addition to braces, there are several other appliances that can help improve and maintain the alignment of your teeth. Patients won’t have to worry about being left in the dark when they’re with Dr. Gary Cartwright and our staff members – we’ll always explain why a specific appliance is needed and how it will benefit your valuable smile well into the future. If you’re interested in learning more, don’t hesitate to contact us! Our practice has two convenient locations in McMurray, PA and Bethel Park, PA. Many people believe that once they’ve completed orthodontic treatment, their new smile will stay that way forever. Unfortunately, your teeth are likely to start shifting back towards their original position over time – that’s why Dr. Cartwright recommends the use of a retainer to prevent this from happening. 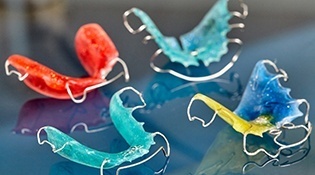 Retainers are typically worn all day and night at first, followed by use only at night. 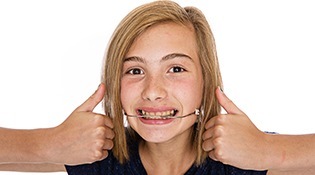 Headgear is a type of orthodontic appliance attached to either braces or a palatal expander that aids in correcting severe bite problems. The most common treatment headgear is used for correcting overbite problems (overjet). The headgear attaches to the braces via metal hooks or a facebow. Straps or a head-cap anchor the headgear to the back of the head or neck. In some situations, both are used. Elastic bands apply pressure to the bow or hooks. 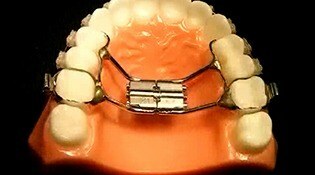 Its purpose is to slow down or stop the upper jaw from growing altogether, hence preventing or correcting an overjet. A palatal expander is an orthopedic appliance designed to widen your upper jaw by gently separating the bones of the palate. It works best in teenagers younger than 15 years old because below this age, the bones of the upper jaw are still pliable. The expander is activated by turning the expander with a key. As the upper jaw is widened, space will develop between the front teeth. This space is closed with braces. Once the expansion is completed, the expander will remain in the mouth for approximately six months to stabilize the upper palate before being removed. It takes a few days to get used to the expander. Initially, patients are likely to experience some lisping; however, your speech will be back to normal within a week. Until you get used to eating with your expansion appliance, eat plenty of soft foods. Pain is rarely experienced, but you may feel some initial pressure on your teeth, in the middle of your palate, and your cheeks. Sometimes patients may experience a slight headache too. You can take over the counter pain medication to alleviate the discomfort. As with any orthodontic appliance, remember to stay away from hard, sticky foods that can break and pull apart your appliance. Be sure to brush all parts of your expansion appliance as well as your teeth. Spacers are little plastic rings that fit between your back teeth and are inserted before the placement of your braces to provide some space between your back teeth. Spacers usually stay between your teeth for one to two weeks, and they are taken out before your braces are put on. They may cause some soreness, but this goes away in a few days. If a spacer comes out a day or two after its placement, try to replace it yourself. If you just can’t put it back, call our office for a replacement. If a spacer comes out a day or two before your regularly scheduled orthodontic visit, it is not necessary to call our office for a replacement. 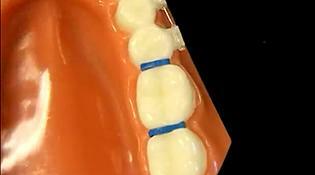 In this situation, a loose spacer means that enough space was created between your back teeth. Please avoid sticky or chewy foods while wearing spacers. Also, do not floss teeth that have a spacer between them. When participating in sporting events, a mouthguard may be the only thing between you and costly dental work, especially for people who wear dental braces. You can continue to participate in any sport you choose with braces! However, when playing sports where there is a possibility of getting hit in the mouth, a specially designed mouthguard will need to be worn. 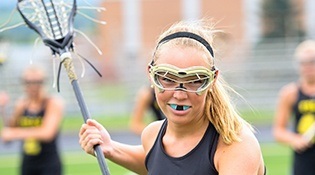 Please be sure to let Dr. Cartwright or an assistant know if you need a special mouthguard. We will be happy to give you one. Do not use a boil and bite or “one size fits all” mouthguard, as these models are likely to break your braces.